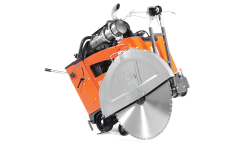 The FS 5000 D is a powerful diesel walk-behind flat saw with low emissions, developed to be compliant with Tier 4 / Stage IIIB regulations. Ideal for asphalt and concrete cutting up to 374 mm deep. 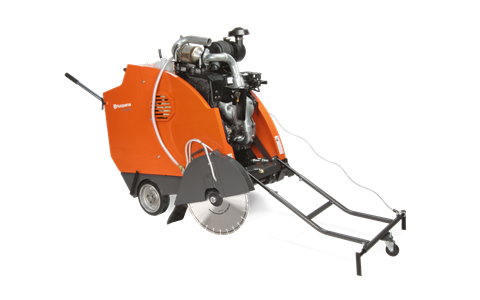 Suitable for mid-sized road work, service work and smaller jobs that require high production rates. Highly versatile thanks to its high output, compact size and good manoeuvrability. Equipped with an intuitive and ergonomic digital control panel with all important functions easy to monitor. Gas-powered self-propelled saw has a low noise enclosed design. 48 hp Hyundai water-cooled engine. Available in rear pivot only for maneuverability in road repair and service work. Control panel is conveniently placed for easy operation. Direct spindle drive or 3-speed gearbox for optimum cutting performance. Robust, convenient all-round floor saw. The adjustable handle ensures low vibrations and an ergonomic working position. Also, perfect weight distribution means excellent stability while sawing. Adjustable, and low-vibration handlebar for operator comfort.